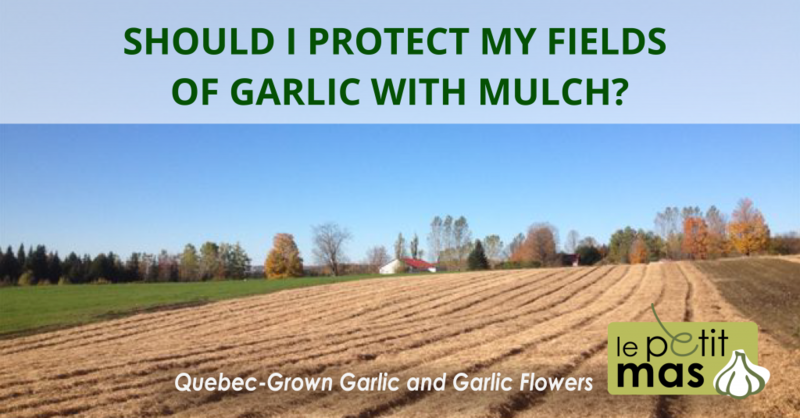 Should I protect my fields of Quebec garlic with mulch? We received these questions by email and thought we would take the opportunity to share our responses with our followers. 1) Will I lose my harvest of Quebec garlic? It is normal for garlic to grow a little during the fall. We also plant our Music variety garlic at this time so that it can develop strong roots and then grow with vigour in the spring. However, don’t worry if the garlic doesn’t sprout in the fall! 2) Should I cover my garlic? There are several ways to do this in Quebec. Some producers mulch with straw, some not at all, and some use other kinds of cultivation methods (plastic mulch, herbicides, etc.). For our part, since we are organic farmers, we protect our garlic with mulch. 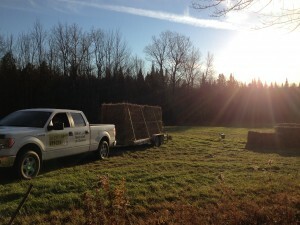 We use straw, but in a garden or for a crop on a smaller scale, you can use dead leaves. – Garlic is sensitive to severe frost and temperature changes (freezing/thawing). This can weaken the plants and make them grow less vigorously in the spring. In Saint-Malo, winters have been very unpredictable in recent years (for example: the snow cover disappeared in February, then there was a period of intense freezing). Covering the garlic with mulch protects it in case the snow cover melts. – The yield of garlic (the size of the garlic bulb) is sensitive to weed competition. Mulch is effective in suppressing weed growth. Unfortunately, the mulch doesn’t do all the work for us. We have to till the soil to eliminate the weeds before mulching, and then weed as needed between the plants and between the rows! – Garlic needs one inch of water per week. Mulch helps conserve soil moisture during dry periods. That said, some Quebec garlic producers do not use mulch. – Depending on the surface area you need to cover, buying mulch can be a significant investment. – The presence of weed seeds in a mulch of poor quality can introduce weeds in the fields. This will indirectly increase the cost of labour for weeding. – When the soil is protected by mulch, it thaws more slowly. Garlic can take one to two more weeks to sprout (compared to garlic that is not under mulch). Consequently, this delays the harvesting of scapes and garlic and selling them in markets. – Lastly, the major challenge of mulching is quantity. Too little mulch will protect the garlic from frost but won’t be effective in preventing weeds. Too much mulch will stifle and kill the garlic. Agriculture is never simple: you need to find the solution that best fits your reality. Please contact us if you have any questions about garlic farming in Quebec or read our Garlic Growing Guide. Whether you are a gardener or a garlic producer, we wish you a happy end of season. The work in the fields is almost done! 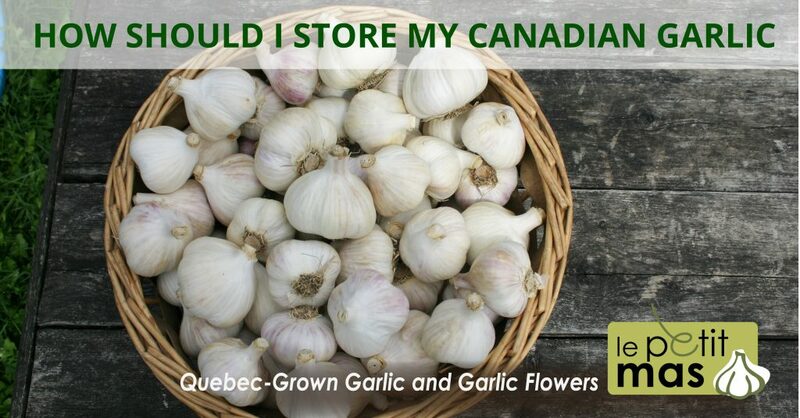 Buy your Quebec garlic seeds in season (early August to late September) from our online store. While you wait for the next harvest, enjoy our fermented garlic flowers available year-round in stores. 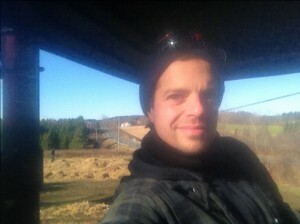 Sébastien Grandmont, co-owner of Le Petit Mas and garlic producer.